August 1981. L-R: my uncle Derek, my dad, my mum, my mum’s friend Sheila, and my godmother, Marge. 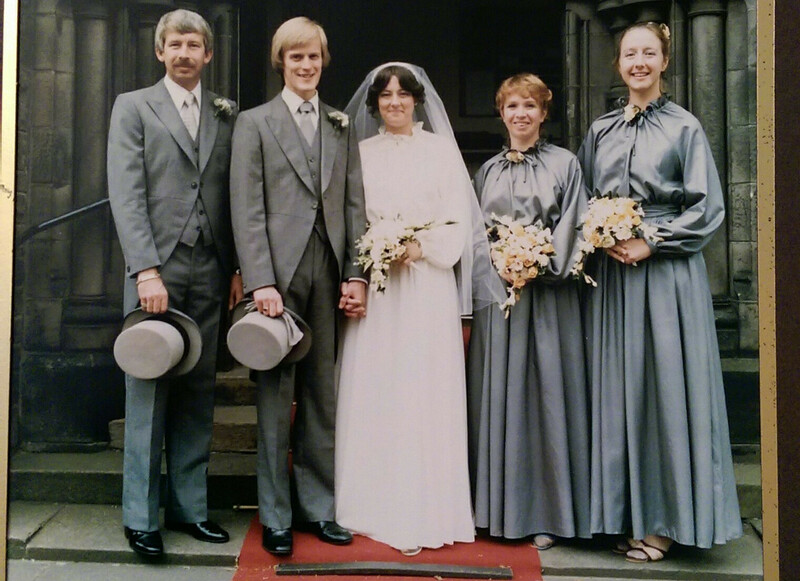 At my parents’ wedding in August 1981, the dresses worn by my mother and her two bridesmaids were handmade (to the same pattern) by my mother’s friend Marge, the bridesmaid on the right in the photo above. When I was born, a few years later, Marge became my godmother, and she’s always been family to me. She’s also been a great inspiration to my crafting, because as long as I’ve known her she has been highly skilled at making: she can do expert patchwork, embroidery, knitting, crochet, and dressmaking, and makes beautiful things for herself and for her lucky friends and relatives. When I was a child, Marge was the one person I knew who did serious dressmaking and she introduced me to the idea that by making your own clothes, you could present yourself exactly how you wanted to. Of course, it took me quite a long time to work out how I did want to present myself, and to realise that making and refashioning were the key to a thoughtful and emotionally satisfying relationship with my own style, but Marge helped me start that journey by patiently making clothes for me when I was a teenager, even sending garments back and forth across the Atlantic for fitting! 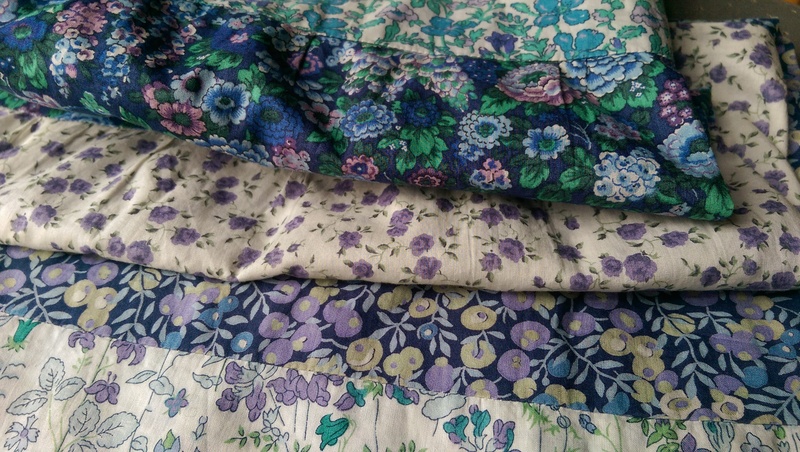 On a trip to London when I was 15, she let me pick out fabrics in Liberty, and then made them into a tiered skirt in the boho style that was all the rage around the millennium; a garment I adored at the time, and still wear. In 2011, I visited Marge at her home in Vermont, and we had a lot of fun rifling through her amazing collection of vintage and handmade things. One of the items she pulled out from a trunk was the silver bridesmaid’s dress she had made in 1981. I can’t remember now if I asked or if she offered, but I came away with that dress, and an idea in my head for exactly what I would do with it. I knew that Lucy would get married one day, and I loved the thought of refashioning the dress Marge had made with such care for her best friend’s wedding into something I could wear when my own best friend (and number one collaborator in all crafting endeavours) walked down the aisle. Lucy got married in August this year, and so the dress’s fate was to be remade this summer. After an extensive process of inspiration gathering on Pinterest, I bought a gorgeous 1986 vintage Vogue pattern on Etsy. 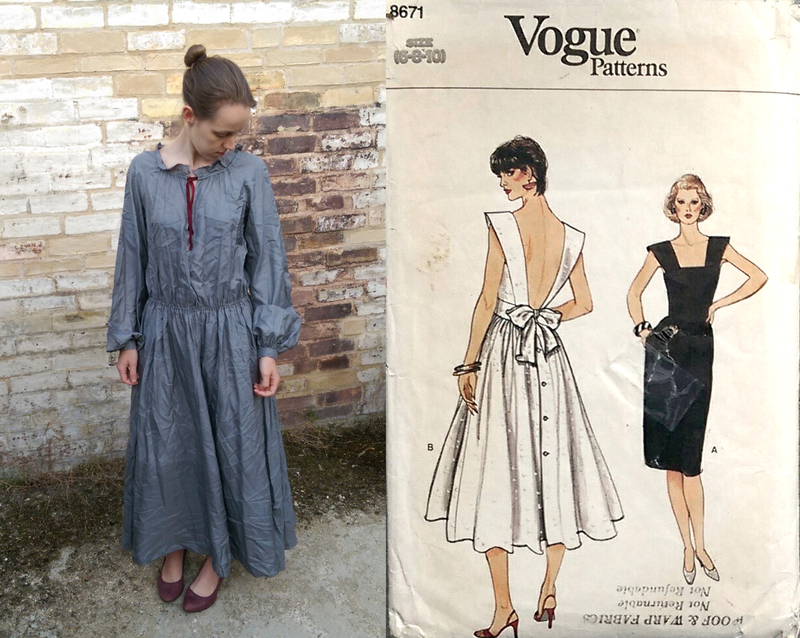 The original dress on me, and the 1980s Vogue pattern. Yes, I should have ironed the dress before taking this picture. Like Lucy, I learned to embrace the slow pace and careful attention that are required for sewing with silk. For the first time ever, I made a muslin, though I then discovered that correcting fit issues is rather tricky on a dress which has neither side seams nor centre back seam! Being inexpert at fitting, I caused myself problems later by taking out too much length on the shoulder straps at the muslin stage: I had to sew them into the bodice with a tiny ¼” seam allowance, and you can imagine my consternation when, sitting nervously in church during the wedding ceremony, I looked down and found that a corner of the strap had escaped from the seam altogether! 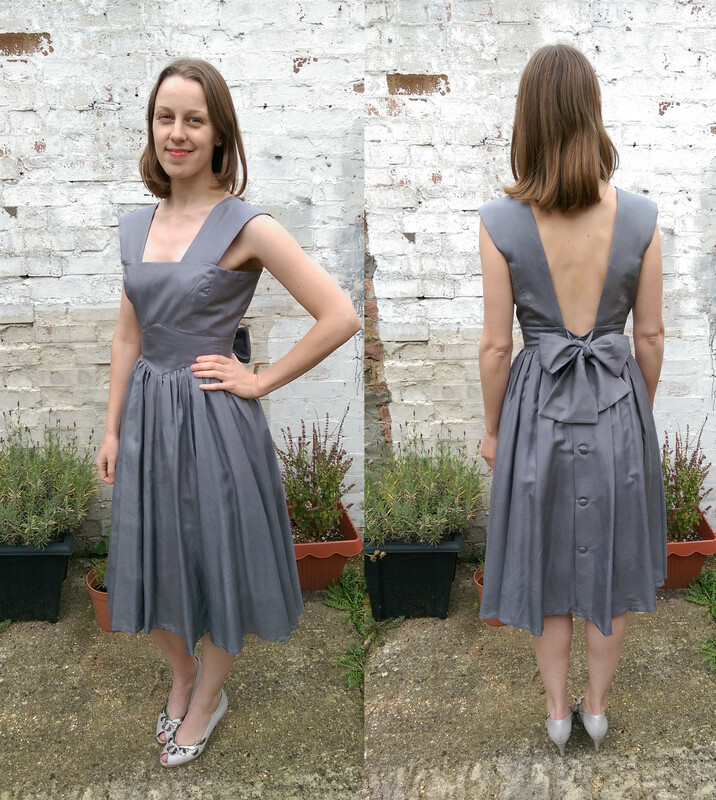 Apart from the pressure of having limited fabric and a very real and important deadline, I enjoyed making this dress, particularly where it involved learning new techniques – like using silk organza as interlining (finally I understand why Gertie does that so often!) and making bound buttonholes. It was also a pleasure to wear; the silk is of a very pleasing character, closely woven and drapey, but not too fluid – like a very fine cotton lawn but with that characteristic silk-y hand which feels so gorgeous fluttering round one’s knees in a full skirt. The slow process of its making gave me plenty of time to mull over the new connections the dress was creating between some of the dearest and most important people in my life: my mother, my godmother, my best friend. As Lucy and I were sharing the experience of couture-style sewing for the first time, and living the excitement of the run-up to her wedding, I thought about my mother and Marge as they made their dresses back in 1981; I wondered how they had found sewing with the same silk I had in my hands, and what the run-up to that wedding had been like. Refashioning felt like having a conversation across time – and it also led to some conversations in the present, about which hopefully I’ll share more in another post. For now, here’s the finished dress. These photos were taken recently – there are hardly any from the wedding itself, when I was too busy having fun! If you do want to see some pictures of the day and its myriad delightful handmade touches, I suggest you pop over to Instagram and browse the #clerkenwed hashtag.